Sewing with denim presents some specific challenges. Denim is a thick fabric that is difficult to sew through; you need a denim needle for your sewing machine and even then sewing over the seam while hemming can make your sewing machine stall. Another issue when dealing with denim is thread size. Sewing jeans also requires thicker thread to produce the typically visible topstitches, and this can affect the way you sew and the way your sewing machine responds. Thread size can be indicated with a "T" followed by a number; there are some other ways to indicate size but the T indicator is fairly common. The smaller the number is, the thinner the thread will be. A T-40 thread will be much thinner than a T-80 thread, and the scale can go up to T-600 or even higher. The letter stands for Tex, and is also referred to as Tex followed by a number. The Tex size of a thread is actually a measurement; it indicates the gram weight per 1,000 meters of the thread before it is dyed. Thicker threads have become more popular because they show up better on the denim. However, most home sewing machines aren't capable of handling very thick threads. Most denim thread that's available for home use will be in the T-50 range, which all but the worst of home sewing machines will be able to handle just fine, as long as you use a denim sewing machine needle. When you get into the larger thread sizes, you're going to be looking at thread for industrial use. When you use thicker thread, adjust the thread tension so that it is higher. Consult the manual that came with your sewing machine when you bought it, or go to the website of the sewing machine manufacturer and see if your manual is available there. At this level of thickness that little bit of tension may not make a huge difference, but it will help prevent your thread from snarling when you're sewing. Before sewing your jeans, you should do a few test runs on a scrap piece of denim to find the best tension. The purpose of having really thick thread is so that it shows up when you're making decorative stitches, like on the back pocket or on the hem of the pants. 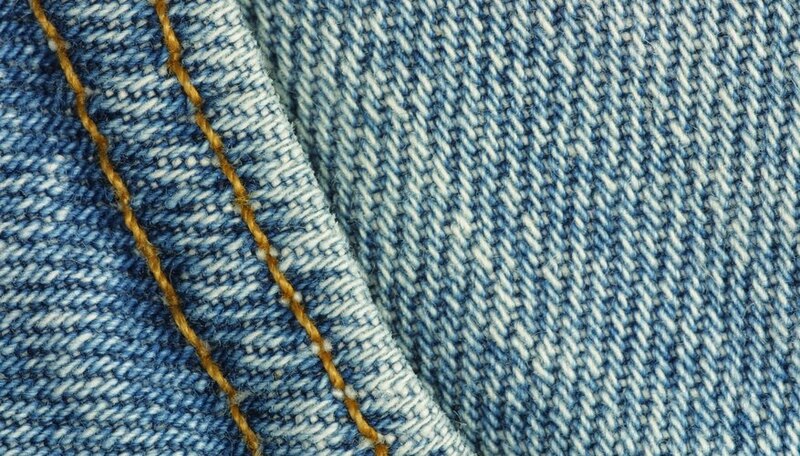 Most denim thread can be used for both purposes when you're making jeans at home. You won't be using thread that's as thick as what comes in industrial machines, as most home sewing machines can't handle that. If you would really like the thicker thread for visual purposes, you can get thicker thread and hand sew any designs you'd like.